Taken with Olympus E500 digital camera March 7th 2008. Click image for larger view. If you have been following this blog you probably know that I enjoy taking photographs of the simple beauties in nature. 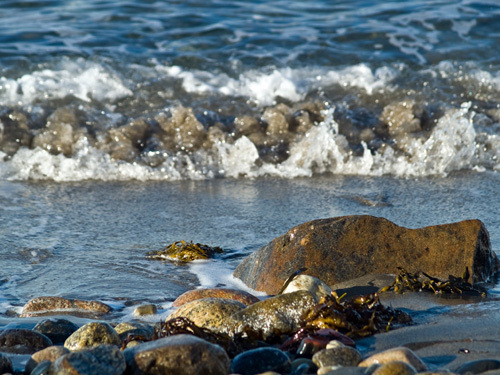 I was walking the beach and liked the colors on the stones, seaweed and ocean so I photographed the scene when a small wave came in. Check out this photo from the same beach but at midnight during the summer when there is light 24/7. I have never been even close to Norway but thanks to your photos, it feels as if I have been there often. Thanks for your hard work and beautiful photos. I always look forward to visiting your site for refreshing pictures. I like finding the beauty in simple things, and this one encapsulates that. I’ve never been to Norway, but I love it already thanks to your photos.